It's time again for another great challenge from the fantastic technique book A Compendium of Curiosities Vol. III by non-other than Tim Holtz. We're on the 13th challenge and it's called Worn Cover which can be found on page 35 of the Compendium book. Have you been playing along? Even if you haven't, it's okay. You can jump in at any time! Just grab your book, try out the technique on a project, and upload it to the challenge here. It's a great way to learn new techniques and try products you might have previously been unsure how to use. Remember there are specific rules you must follow in order to be entered in the challenge for a chance to win some fabulous goodies, so take a few minutes to read the rules here before you post. We on the Curiosity Crew have discovered some amazing projects submitted that didn't comply with the rules, and sadly have had to disqualify those entries. So be sure to read those rules. For more info about this current challenge, keep reading to the end of my post today. This challenge is more of a product intro rather than a specific technique. I selected the Worn Cover, Christmas Wishes to make a useful reference book of holiday cocktail recipes. 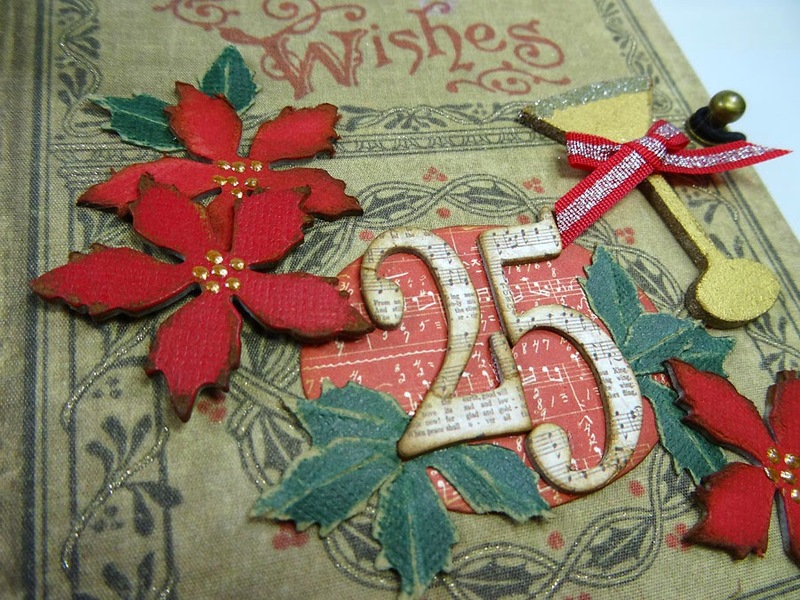 To adorn my cover, I used several Alterations dies (links below) to cut out festive holiday shapes like these poinsettias & leaves (the same die) and the number 25. 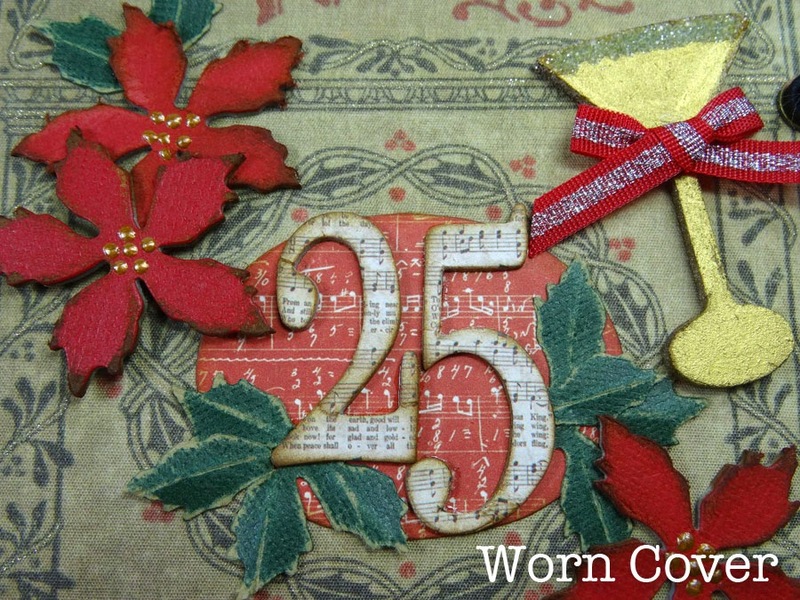 Kraft Core card stock is perfect for sanding and distressing the flowers and leaves, and the 25 is covered with music note paper from the 8 x 8 Seasonal paper stash and I used the Merriment paper stash for the oval in the background. For dimension, all the shapes were also cut from Grungeboard except for the leaves. Oh, and that cocktail glass is a chipboard shape I found in the Michael's discount bin. A pack of 8 for a dollar. I painted it with Tarnished Brass Distress Paint and frosted the top with Distress Glitter. 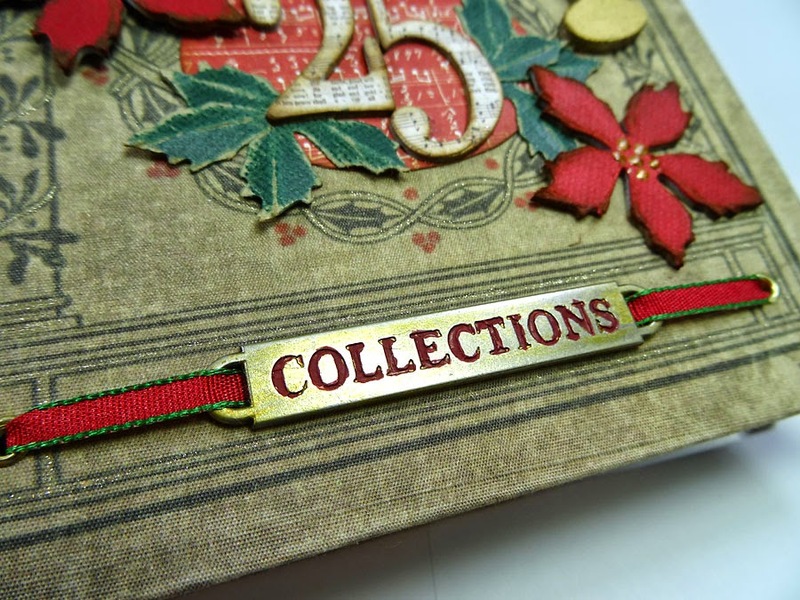 I labeled my recipe book with this Observation Word Band and some pretty May Arts ribbon. The Crop-a-dile punches through the Worn Cover easily, and gold eyelets gave the holes a more finished look. I painted the word band's surface with Tarnish Brass Distress Paint and hand painted the recessed letters with red acrylic paint on a fine paintbrush. I also used the Crop-a-dile to punch holes for the closure here. A hitch fastener on the cover and an elastic band comes around from the back cover. As you'll see in a moment, I used the Large Ring Binder inside the book, affixed with a strong glue (E6000) then once the glue was dry, I weaved this pretty satin ribbon through and holes and tied them into a big bow at the outer spine. A trinket pin and jump ring are perfect for hanging my stamped red tag. Inside I put the recipe tags into Page Pockets. This will now be a quick reference guide during the holidays when entertaining. I have six recipes now, but eventually I'll add more. So if you have a favorite you'd like to share, I'd love to try it out and add it to my book. Just e-mail me at AnnetteGreen@me.com with your recipe OR send me the link in your comment if the recipe is online. For those who send me recipes, I'll put your names into a drawing for a small prize package. Keep watch on my blog Tuesday the 14th and I'll announce the winner there. And don't forget, you can find these great products I've used today at InspirationEmporium.com. What a clever idea to make a recipe book for the best time of the year! Your sugar frosted glass is a little stroke of genius too. I've put it in 1/2 pint jars, tied with a ribbon and attached the mixing directions. Add a couple of mugs for an easy gift. A stunning example of a worn cover!! Brilliant take on the theme, and useful too, love it!! What a wonderful idea, very festive too! 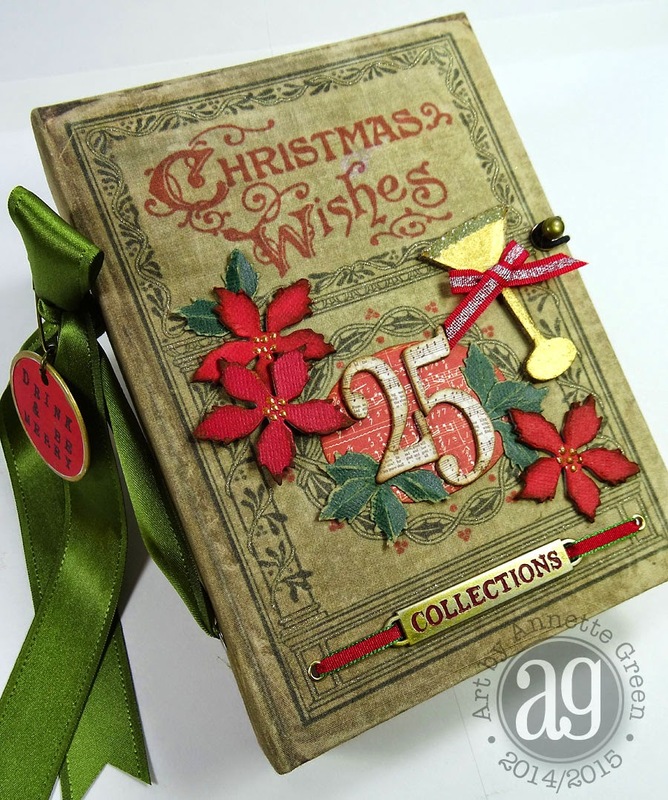 I like all the embellishments (fabulous inspiration)That red and green against those worn covers is just gorgeous ! Love this idea! I'll be sending you my Nana Sara's Sour Cream Coffee Cake recipe later! 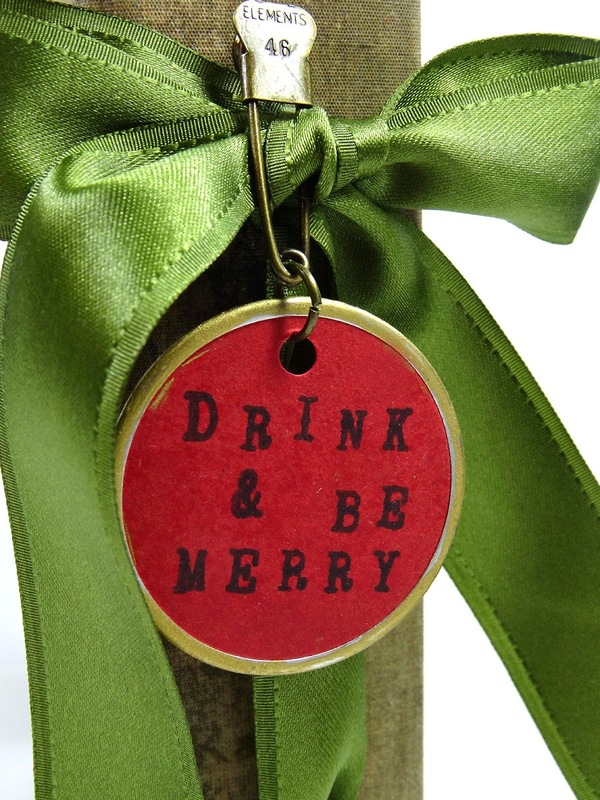 I love your holiday idea for keeping holiday drink recipes easily at your fingertips. Using this format, you'll be able to constantly rearrange them or delete them with ease. What a clever idea, Annette! I love that you are putting cocktail recipes in it! The cover is so beautiful! I don't have one of the Christmas ones, but now I have to have one. The details are so beautiful - love, love, love! All of you girls are blowing me away with your ideas! What a great cocktail book! It is so elegant as well. LOVE this Christmas treat! Holiday cocktail recipes??? Can I come to your house for the holidays? YAHOO!!! I LOVE that idea! So festive and fun! A very elegant styled Christmas cover and such a fun idea with your cocktail recipes inside. Genius. Its a great Idea, i loved it. Talk about making spirits bright!! 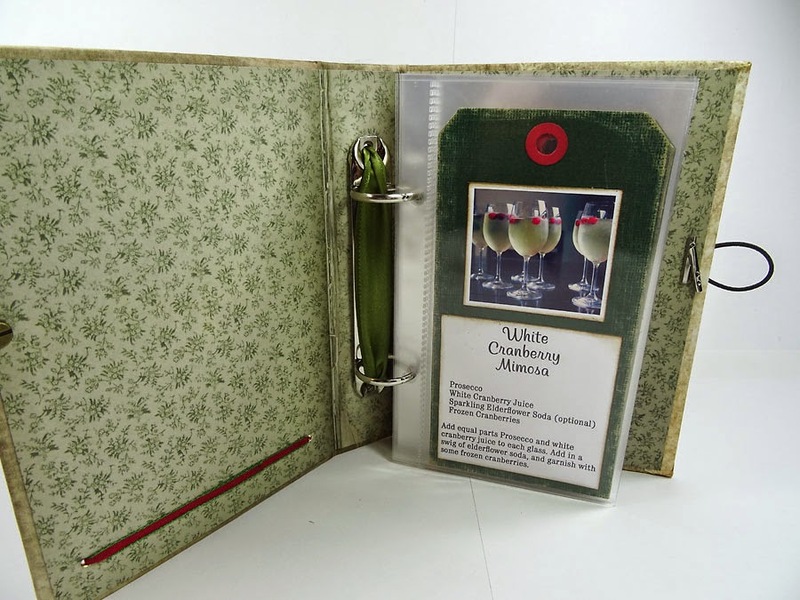 You've created such a fun & festive beverage book :) Fabulous CC3 #13 inspiration, Annette!! 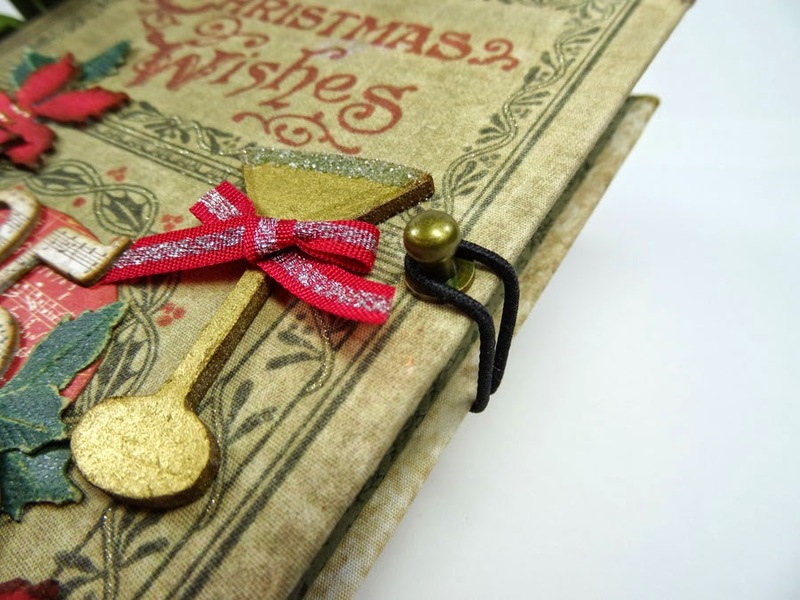 XOXO-Shari T.
Fun little book to pull out at holiday time to keep the holiday spirit going. The poinsettia and leaves are such classic images and the perfect choice. That pretty ribbon makes a wonderful statement. Along with the cute round tag. What a super idea for Christmas party drinks recipes. BTW I'll be round later to try a few Hic. I love how your decor on the front blends in with the rest of the natural cover itself...Lovely and inviting...Well done. The hitch fastener is brilliant! Mine is just flapping open. I might need to remedy that! Cool idea for drink receipes .. I love the challenges that aren't technique based because I have all the stuff and it makes me use it !! :) Awesome project !! I love your Christmas Cover! Such a cute idea! Love your cover, Annette! The #25 is awesome and I really like the bright red in the wordband. What a neat idea to collect readers' recipes, too. Yeah, yeah, the cover is fabulous...but i really want to see the recipes! LOL! Joking aside, this is a wonderful idea and would make a great hostess gift! Your cover is a Christmas delight! I love that you are using it for recipes and all decorated with a Christmas theme! Thank you for the beautiful inspiration! Great idea on the recipes. I love this idea. I love all the detail. What a fantastic idea, Annette! You are just rocking along on this creative journey, aren't you? I'm absolutely getting one of these Christmas worn covers and putting one together myself. Awesome! Not a recipe, or drnks, kind of gal but the tag idea is a great one! And I loce your cover! What a wonderful idea Annette, a holiday cocktail recipe book! Love the poinsettias and your number 25! Such a beautifully embellished cover! Wowww, love your Christmas worn cover Anette! Can't wait until Christmas is coming! Great idea for this book and I love all the special details which truly makes it yours. This is a great idea! Love your project. It's so pretty and also makes me want to become tidy and organized too. Someday... Thanks for the inspiration! I love the wide ribbon and the tags inside! Cute! This is beautiful. It would work great for a December Daily. Now that's the kind of recipe book I could get into. I don't cook much anymore, hubby has taken that job over, but I still like to make a cocktail!! 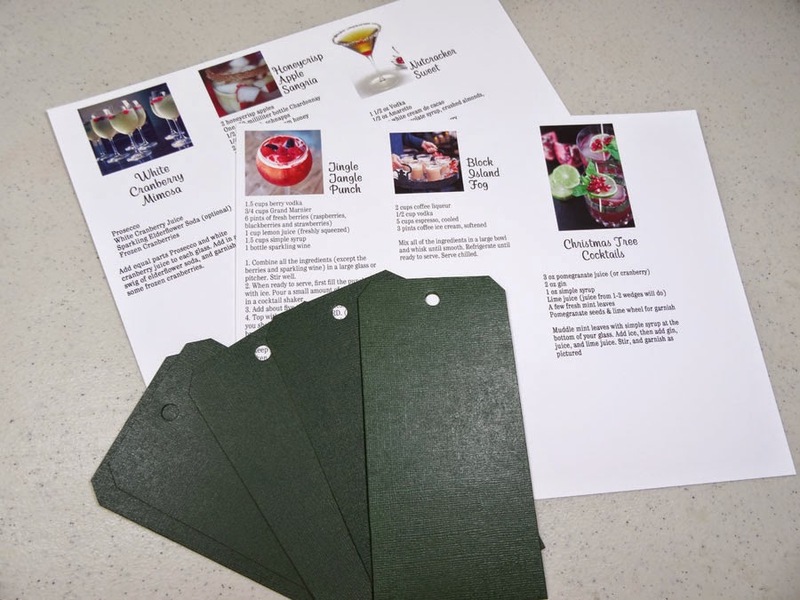 I love the idea of a book of holiday cocktails, so much fun Annette! Beautiful cover Annette! Another great idea!